RTA has initiated a study to examine the possibility of enhancing transit service in the northeast section of RTA’s service area. This study, called RTA’s Red Line HealthLine Extension Study, will identify transportation opportunities that may support and sustain future growth and economic redevelopment in East Cleveland, Euclid, Collinwood, and adjacent communities. The study will do this by collaborating and building consensus around successful transit service improvement strategies. The outcomes will guide RTA’s investments for years to come. In late 2013, RTA advertised solicitation #2013-162, a Request for Proposals (RFP), seeking a team of qualified consultants to complete a planning analysis for a major transportation improvement. Timeline, updated Feb. 17, 2016. January 2013: RFPs due to RTA. February 2013, RTA staff reviewed the proposals. March 2013: The RTA Board of Trustees passed resolution #2013-15, selecting AECOM Technical Services to complete the study for $1.1 million. Federal funds will pay for 80 percent of the cost. May 2013: Completed Community Engagement Plan. October 2013: Finalized the "purpose and need" statement. Fall 2013: Began initial evaluation of alternatives. Winter 2015: Refine remaining alternatives and conduct Tier 3 screening. May 2016: Publish Final Report and post on the Web site. The Greater Cleveland Regional Transit Authority (RTA) is dedicated to providing high-quality transit service to all of Cuyahoga County. RTA’s 2010-2020 Strategic Plan serves as a roadmap to reimagining its future. The plan describes actions for refocusing, restructuring, renovating, reallocating and reenergizing RTA’s services and capital investment programs. Based on that Strategic Plan, RTA has initiated a study to enhance transit service in the northeast section of RTA’s service area. The outcome of the study will guide RTA’s investments for years to come. The study process will consider a wide range of possible improvements and identify the best possible choices. For this reason, RTA is investigating the feasibility of extending either the Red Line rail or HealthLine bus rapid transit lines east from Louis Stokes Station at Windermere. Potential route alignments could include links from Windermere to Lakeshore Boulevard, St. Clair Avenue or continue east along the Euclid Avenue corridor to the City of Euclid and adjacent communities in Lake County. The proposed Red Line/HealthLine extension could restructure service on Greater Cleveland’s northeast side by improving access to University Circle, Midtown and Downtown Cleveland and by reducing travel time and cost from the furthest reaches of RTA’s eastern service area. By providing additional mobility options and improving access to the region’s core throughout the day, redevelopment opportunities will be increased in this part of the RTA service area resulting in substantial economic benefits, which improves regional competitiveness. The study area includes the northeast portion of Cuyahoga County bounded by Lake Erie on the north and Lake County on the east and contains portions of three cities: Cleveland, East Cleveland, and Euclid. Specifically, the study area and corridor for the Red Line/HealthLine extension major transportation improvement analysis approximately starts at the CSX Short Line right-of-way in the west (and adjacent former Cleveland Union Terminal railroad) and extends east along the southern boundary, which is the ridge line separating the lake plain from the heights area of Cleveland. Opportunities to link future transit with existing land use patterns and anticipated land development. The planning process will integrate urban design, community form, and economic development considerations with the required transportation planning and engineering analyses required by federal regulations. The study may result in new investment decisions in the service area, to help achieve sustainability goals and improve the quality of life for the residents who live in the study area. Transit is a key piece of the livability puzzle and the funding prioritization process. Alternative Development. The Alternative Development process is designed to identify and define different transportation options and to consider a wide range of transit improvement possibilities to meet future needs. Alternative Evaluation. This process examines the impacts of the alternatives, and makes sure that they address the community's needs and make transportation and financial sense. Alternative Selection. This final step will give you opportunities to review preliminary results, ask questions and help inform the final decision. Early and continuous public outreach and input: Ask often and in ways that people want to use: What does the community want? Development of the study's purpose and need: Help the community and the study's stakeholders understand: Why should we make improvements now? What specific existing and future conditions can we identify that will indicate a need for improvements and guide alternative development? Development of a wide range of alternatives and criteria for alternative evaluation (screening): Develop and share a well-thought-out, creative set of answers to the question: What might work to address the identified needs? Environmental impact analysis:Develop the clearest possible understanding of potential impacts: What natural resources, community resources, social conditions, and economic factors should we be considering? Detailed screening: Apply the information to date to the alternatives, and determine which are the most feasible: What are the best improvements? Which possibilities should not be considered and why? Recommendation of a Locally Preferred Alternative: Determine, with the community's input, which of the alternative makes the most sense: What improvements provide the best overall solution and support funding? This document outlines the final evalation of the Alternatives that was conducted as part of this project. This is the second half of the Appendix B document. This is the first half of Appendix B of the Environmental Red Flag Analysis. This appendix documents environmental features that may be impacted by the Study's alternatives, as designated by the Federal Emergency Management Agency (FEMA). This Appendix identifies water and historic resources, as defined by federal regulations, that could be impacted by the Alternatives. This appexdix documents the proximity of the Alternatives to a variety of resource types, as designated for review under Federal regulations. Appendix A, which outlines the Alternatives and their proximity to sites that meet certain Federal standards, such as environmentally-sensitive locations and sites that may be eligible for the National Register of Historic Places. Appendix C, which identifies water resources and sites that meet certain federal historic designation standards. This document systematically reviews the Study's initial alternatives, including both routes and technological options, against the screening factors that were developed from the Purpose and Need criteria. It provides a factual basis for evaluating the potential strategies that the Study could recommend. The Alternatives Analysis Methodology explains the process and criteria that will be used to evaluate the potential alternatives for meeting the objectives of the Red Line/Healthline Extension Study. This report will lay the foundation for the process that is used by the consulting team and the public to select among alternatives in the Study. The Purpose and Need Statement formally outlines the reasons why the study is necessary. It gives an overview of the existing issues and identifies the overarching issues that the Study should address. The Purpose and Needs statement will provide an important basis for evaluating potential alternatives. The link below will allow you to access and download the Red Line/Healthline Extension Study Baseline Conditions Report. Please be advised that, due to the number of graphics and photographs, the file exceeds 10 Mb. Re: Imagine RTA - Strategic Plan 2010-2020 sets the groundwork and establishes the importance of the Red Line HealthLine Extension Study within RTA's overall system. This link takes you to the full text of the document, which is in a web page. This is the presentation given at the meetings in May 2014. This slide deck contains the information that was presented at the Public Open Houses that were held in December 2013.
Who is working on this study? Which government agencies are involved? What are their roles? What improvements are being considered? What is the study area? Where do I go to get more information? Who is going to pay for future improvements and when will the improvements be completed? How can I be an effective participant and make a difference? Who is working on the study? RTA has hired AECOM, a global consulting firm that specializes in transportation planning and engineering services, to lead the Red Line/HealthLine Extension Study. At this point in the process, specific improvements have not been identified. One result of the public scoping process will be to identify possible improvements. The following map generally defines the study area. The study's website provides up to date information, and timely information will also be shared via Twitter, YouTube and Facebook. Information will also be available at study meetings, at RTA’s offices and at libraries within the study area. The study will help RTA secure funding for the recommended improvements. No dates for improvement initiation or completion are available at this time. Rail and bus transit service within the RTA system, particularly the northeastern RTA service area, has not been able to fully meet the region’s needs, given existing and future land development and travel demand patterns. The region needs improved connectivity, particularly to University Circle and Midtown. In addition to potentially generating economic development benefits, the study embodies a sustainability perspective by creating a more vibrant, livable community, which enhances its residents’ quality of life through improved access and mobility, especially for transit-dependent populations. A key goal for the Red Line/HealthLine extension major transportation improvement analysis is to provide sufficient technical, financial, and economic information to RTA, local governments and the community to make an informed decision. Effective participation involves being informed and submitting ideas and information that helps make the study better. You can become informed by reading study documents and attending meetings. We will share a variety of opportunities for input, both at in-person meetings and through online methods. We'll also use surveys and other tools to help clarify the type of input that would be helpful. Since the study must be completed on schedule due to funding requirements, we will also share deadlines for specific kinds of input. UPCOMING PUBLIC MEETING! Please join us from 6p-8p on February 11, 2016 at the Collinwood Recreation Center (16300 Lakeshore Blvd, Cleveland Ohio 44110) to discuss the findings and recommendations from the Red Line/HealthLine Extension Study final report. Come and learn about the Red Line/Healthline Extension Study! Representatives from the study team will introduce you to the study, explain the issues and ask for your experiences and insights. All are welcome. This meeting will be at MCMS, Inc., 22639 Euclid Avenue. Come and learn about the Red Line/Healthline Extension Study! Representatives from the study team will introduce you to the study, explain the issues and ask for your experiences and insights. All are welcome. Come and learn about the Red Line/Healthline Extension Study! Representatives from the study team will introduce you to the study, explain the issues and ask for your experiences and insights. All are welcome. This meeting will be held at the East Cleveland Public Library, 14101 Euclid Avenue. We can’t do it without you! There are many ways to participate in this study and have your voice heard. Watch the Study’s Informational Videos! Details and maps of the build alternatives that remain in consideration are provided below. Many more alternatives were evaluated in during the Tier 1 and Tier 2 screening processes. You can read those reports and learn about the evaluation criteria on the "Documents" tab. The Tier 3 screening, which will be conducted in 2015, will compare the remaining build alternatives (B, E, G and the hybrid) with "No Build" and "Do Minimum" alternatives. After gathering public input on the Tier 3 screening results, a Locally Preferred Alternative will be selected and presented to the RTA Board of Trustees and the NOACA Governing Board for approval and adoption. Description: A Red Line (heavy rail) extension that continues beyond Louis Stokes Station at Windermere and running east adjacent to the Norfolk Southern (NS) freight railroad corridor. Alternative B would terminate at the Euclid Park-N-Ride near the intersection of St Clair Avenue and Babbitt Road in the vicinity of Euclid Square Mall. High development potential areas along Euclid Avenue and in vacant industrial areas. Of the two freight corridor alignments, Alternative B is superior to Alternative A in providing service to a larger number of segments with high development potential. One historic property, and seven Section 4(f) areas (two playgrounds, one public pool, and four parks) would experience noise and vibration. Three historic properties. Heavy industry is adjacent to railroad corridor; these areas include many hazardous waste sites, 58 in all. Direct route to Euclid Square Mall area, terminating at Park-N-Ride near Babbitt Road. The alignment is generally parallel to Euclid Avenue, usually about ¼ mile south of the railroad alignment and never more than ½ mile away. Intended as electric heavy rail but options include light rail/streetcar or diesel/electric technology. The East 193rd Street Station serves Duggan Park with easy walk access, with connections to RTA local buses at Noble Road Station and East 222nd Street Station. Alternative B is the shortest line of all the alternatives. to Shoregate Shopping Center in Lake County. Alternative E is consistent with City of Cleveland planning efforts to revitalize the Collinwood neighborhood, centered around Five Points and the Waterloo Arts District, as well as with City of Euclid planning efforts. This alternative provides some revitalization opportunities in East Cleveland along Euclid Avenue. Two properties listed in the National Register of Historic Places, one property determined eligible for the National Register of Historic Places, and six Cleveland Landmarks. Additionally, this alternative also includes approximately 11 mapped Section 4(f) resources: one public school, one playground, two trails/bikeways, one state park, and five parks. This alignment contains many cultural and historic resources, so public safety will need to be a priority. Alternative E also includes five mapped hazardous material/waste sites. This alternative would operate as an extension of the existing HealthLine bus rapid transit service that begins in downtown Cleveland. 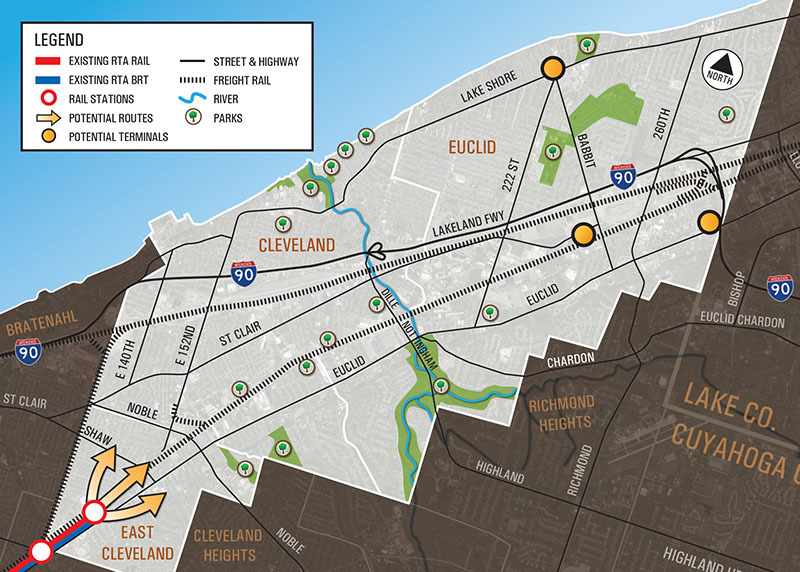 It would continue beyond Louis Stokes Station at Windermere to directly serve Euclid Avenue, Five Points, Waterloo Arts District, Euclid Beach Metro Park, Wildwood Lakefront Metro Park, Humphrey Park, Villa Angela – St. Joseph High School, Euclid General Hospital, Downtown Euclid and Shoregate Shopping Center. Stokes-Windermere Station remains the major interchange station for connections to the Red Line and local bus routes. A possible interchange point with Laketran could be constructed at Shoregate Shopping Center. Description: A HealthLine (bus rapid transit) extension that continues beyond Louis Stokes Station at Windermere and runs east along Euclid Avenue to Ivanhoe Road where the alignment turns north to East 152nd and St. Clair. At Five Points, the alignment turns east on St. Clair Avenue to Nottingham Road where it turns north until reaching E. 185th Street. At E. 185th Street, the alignment turns northeast serving the E. 185th Street commercial district up to Lake Shore Boulevard where it turns east to Shoregate Shopping Center in Lake County. This alternative is very consistent with City of Cleveland planning efforts to revitalize the Collinwood neighborhood, centered on St. Clair Avenue between Five Points and Nottingham Road. This alternative is consistent with City of Euclid planning efforts for Lake Shore Boulevard. This alternative provides good revitalization opportunities in East Cleveland along Euclid Avenue, and serves more high development potential sites than any other alternative. Three properties listed in the National Register of Historic Places, one property determined eligible for the National Register of Historic Places, and two Cleveland Landmarks, and many schools, churches and theatres. This alternative includes approximately nine mapped Section 4(f) resources: four public schools, one playground, two trails/bikeways, and two parks. This route also shares the Cleveland Lakefront State Park Bikeway and will have special safety concern needs. This alternative would operate as an extension of the existing HealthLine bus rapid transit service that begins in downtown Cleveland. It would continue beyond Louis Stokes Station at Windermere to directly serve Euclid Avenue, Five Points, Nottingham Village, the E. 185th Street corridor, Villa Angela – St. Joseph High School, Euclid General Hospital, Downtown Euclid and Shoregate Shopping Center. Stokes-Windermere Station remains the major interchange station for connections to the Red Line and local bus routes. A possible interchange point with Laketran could be constructed at Shoregate Shopping Center. Description: This alternative combines a short Red Line extension to Noble Rd with the HealthLine Extension alternatives (E and G). More details will be provided at the February 11, 2016 public meeting.